On 22 June, a big demonstration took place in the Novokhopersk district of the Voronezh region. It was calling for a complete ban on non-ferrous metal mining in this Black Earth region of Russia. The protest took place in response to criminal charges, which have been brought against several of the local residents; the charges were initiated by some very senior members of the Russian police, but now they themselves have been arrested. According to official reports, the deputy head of the Russian Interior Ministry's Anti-Corruption Department, Boris Kolesnikov, committed suicide on 16 June after being interrogated at the Investigation Committee. 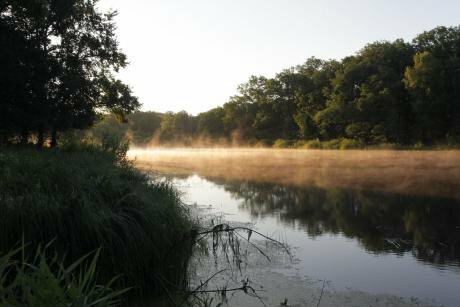 The battle has been going on for more than two years in this quiet provincial backwater on the banks of the river Khoper, one of the cleanest rivers in Europe. Local residents are trying to prevent the construction of mines and a processing plant to develop the copper, cobalt and nickel deposits. The potential mining area covers several regions in Russia's Central Black Earth region, radiating more than 100km from the deposits. 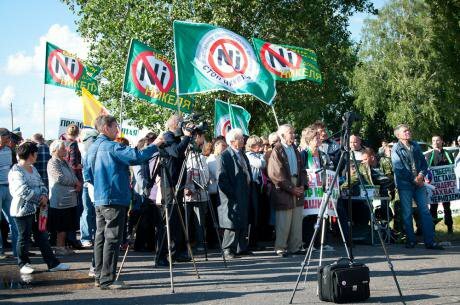 Scientists who have taken the side of the protesters talk of catastrophic consequences for the region: the formation of a cone of depression (lowering the water levels) of up to 100km wide; and the pollution of the environment by highly toxic matter, including nickel, cobalt and arsenic compounds, which are to be found in the ore materials. The legendary Khoper Nature Reserve, which has the relict Russian desman and white-tailed eagle living in it, is only 15km from the deposits, so there would be little left of the reserve's unique untouched nature after mines measuring one and a half km deep have been sunk into the earth; and a processing plant with dusty slag heaps is rising above it. The demonstration of 22 June had been called to remind the project’s lobbyists what happened here two years ago. Four thousand people had gathered near the geologists' base camp on the Yelansk minefield: they tore down the fence and destroyed the drilling machines. Anyone with any knowledge of the situation could have predicted these events, which were provoked by the complete lack of communication between the people taking the decisions and the population directly affected by them. The Urals Mining and Metals Company (UGMK in Russian) had issued licences for both additional prospecting and production from the Yelansk and Yelkino deposits at the same time, rather than sequentially, and had not produced one meaningful document about the long term effects of the works on local inhabitants and the region. In 40 years time, when the deposits are exhausted, this area will be a ravaged wasteland. Some of the the world's most fertile soil and the purest water will be destroyed. In 40 years time, when the deposits are exhausted, this area will be a ravaged wasteland. But the popular protests are doing nothing to reduce the gulf between the population and the authorities; on the contrary, it is only becoming wider. Criticism makes the authorities dig their heels in; the company simply accuses the population of ignorance. The Khoper Nature Reserve, located close to the nickel deposits, is home to the white tailed eagle. In their statements, people write that geological prospecting is being carried out on agricultural land, that construction is going forward without the expert opinion required by law; and that the wells drilled by the geologists who worked here in the 1970s are leaking radioactive underground brine. In response, UGMK simply goes on saying that everything is in order. The company makes a great show of measuring radiation a kilometre away from the problem wells, and portrays the protesters as village idiots. Locals have no patience with the (paid) newspaper articles extolling the uses of nickel, and the assertions that the protesters are working for the US State Department. The company portrays the protesters as village idiots. What really emphasises this gulf of mistrust, however, is that people can see that even the most harmless requests from the local police are ignored by UGMK: a good example of this was the demand that the fence around the geologists' camp should be taken down, because it was blocking the road to other areas of land; her fence stayed where it was. At that point, the locals realised that no one except them was going to do anything. On 22 June 2013, the protesters tore down the fence themselves, and destroyed the machinery, which had been drilling kilometre-deep wells on agricultural land. I am writing this article from a hiding place. If the Russian police find me, for certain I will end up in prison. This has happened to two local people falsely accused of blackmail. UGMK was not satisfied with drawing up a blacklist of protesters: Pyotr Yamov, deputy general director of UGMK, called in police general Denis Sugrobov, on the grounds that some of the activists were blackmailing the company, demanding money in return for ceasing the Khoper protests. Sugrobov is head of the Anti-Corruption Directorate. Together with his deputy, Boris Kolesnikov and Oleg Silchenko (one of the people on the 'Magnitsky List') he decided to sort things out. On 25 November, a man from Borisoglebsk, Mikhail Bezmensky, was arrested with a bag of money he had received from another UGMK top manager, Yury Nemchinov. In a few hours' time, that bag of money brought about the arrest of the former Cossack chieftain from Novokhopersk, Igor Zhitenyov. The next day, Bezmensky rang me and suggested a meeting in Moscow. I invited him to a café near where I was at the time, but he insisted on meeting in some kind of hotel. I refused. At that moment I had a call from Novokhopersk saying that Zhitenyov and Bezmensky had been arrested the day before. Immediately after that, there was a call from the concierge downstairs to tell me that there were about eight policemen waiting for me outside the door. I haven't been home since then. The next day, the police broke down the door and searched the flat, removing all possible sources of information. It subsequently transpired that Bezmensky himself had volunteered to work with UGMK. They had tasked him with winning over Zhitenyov by threatening the health and safety of his family. The next day, the police broke down the door and searched the flat, removing all possible sources of information. More and more appalling details started to emerge: Sugrobov and his deputy Kolesnikov were themselves arrested for demanding bribes; in effect, for what they had organised in Khoper, only this time the money was for the FSB officer who (with his colleagues) had caught the policemen. 'I was badly beaten up, not my face or my head, but kidneys, liver and chest, until someone said "Let him be, we need him alive." Then I was visited by officers from the department dealing with corruption in the police (chief directorate of Economic Security and Anti-Corruption Measures): Alexander Filippov, Pavel Levitsky and Oleg Silchenko from the Criminal Investigation Department. Levitsky told me I would have to sign everything they gave me; I refused and asked for a lawyer. Filippov told me not to stand on my rights; he showed me a photo of my house on his phone and said, "Unless you do exactly as we tell you, it's curtains for your wife – she'll be sent to prison, where anything can happen, and you don't want your child to be on its own, do you? 'Filippov said, "We're planning a sting with Zhitenyov – we'll go to Borisoglebsk and you'll get him to take 15m…your life and your wife's will depend on whether he does or not." Once more I signed, but not my usual signature, both the sting document and confirmation that I had received the money. I was taken to Borisoglebsk in a UGMK car, and I realised that it was the company that had set this all up. This made me even more scared, because I know what kind of people they are, and what they are capable of. I realised that it was the company that had set this all up. 'It was 27 November 2013, about 11 in the morning when we got to the building of the Chief Directorate – more threats and blows which winded me. In the corridor I saw Pyotr Yamov embracing some of the Directorate officers, and heard a conversation between Aleksander Filippov and someone else about 500,000 roubles for everyone taking part in the operation. I was then taken in to see the chief, Boris Borisovich (only later I learnt that this was general Kolesnikov). He was a young man in a very expensive suit. There were several others in the room. BB said I would be taking part in the 'sting': I was to ring the journalist Konstantin Rubakhin and arrange a meeting. I explained that I hadn't been in touch with him for six or seven months, but no one paid any notice. BB asked me if I thought Rubakhin would accept a fairly large sum of money; I said I thought it unlikely – and what would it be for? "You'll say that UGMK has given you a lot of money and you want to share it with him."' I replied that from UGMK he certainly wouldn't take it. Then a brown leather bag was brought in: in it were 7m euro, in 500 euro notes. BB said "Just put the bag down by him and we'll do the rest." Then a brown leather bag was brought in: in it were 7m euro, in 500 euro notes. 'I rang Rubakhin and said my wife and I had come shopping in Moscow – everything I'd been told to say (and there is a police video of this). The meeting didn't happen, because the officers were so slow, but I was taken all over Moscow, looking for Rubakhin. There were several officers with me who were constantly phoned by one of the bosses, who kept shouting "You'll go on looking till morning, but you must arrest him!" 'That was in 2013. This year, Aleksander Filippov and Pavel Levitsky visited me only occasionally, but they threatened me, saying that if I told my lawyer what had happened, how I was arrested etc., then I wouldn't get out of the remand prison alive. I would be put in a special torture cell, beaten and raped; the conditions would be indescribable. They already had my wife in an apartment, and her life depended on me. I was so scared that I told the lawyers nothing, indeed panic rendered me unable to say anything at all. The worst time was at the end of February, early March, when I was visited often to make me sign a plea bargain (I didn't know at the time that general Kolesnikov himself had been arrested). The stress was unbearable and I knew that it was just as bad for my wife: after suffering two strokes she was hospitalized, and I decided to top myself by slitting my veins or hanging myself. But the watch in the remand prison is efficient and I was quickly referred to a psychologist. 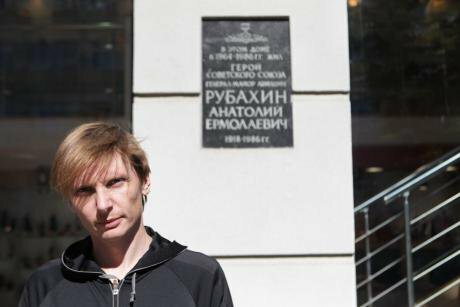 'On 28 March 2014 I was taken to the Criminal Investigation Department to see Pyotr Yamov, Pavel Levitsky and some other high-up from the Directorate. When I was brought into the room, Yamov ordered the guards to leave. They refused, so Yamov asked them not to tell anyone what they were just about to hear. Then he said to me, "There's only one way to talk to you, Mikhail: you have to dismiss your lawyers and I will give you mine." When I asked who this would be, Yamov said, "Oksana Yakimova – you may remember her. She's here now, so sign the document." Levitsky immediately started threatening that if I didn't do it, I would be sent to a prison camp in Magadan. Yamov said that Zhitenyov and I would be given seven years of hard labour, was that really what I wanted? I would have to sign the plea bargain, because they needed to cover up for someone else. He added that some FSB and Interior Ministry people in Voronezh had not done what they were told, so they would be put inside, but "You, Mikhail, will get a short sentence, a flat, a job in a company and good money." 'At the time, my lawyers were in the next room. I asked for a week to think things over. On 31 March, Levitsky came to see me, demanding a written dismissal of my lawyers, but I said that I was not yet prepared to do this. He recommended Oksana Yakimova as a serious and highly paid lawyer. Then he rang Pyotr Yamov and passed the phone to me. Yamov said that they hadn't spent much money on me yet, and were prepared to pay for court trials, prosecutors etc if I refused to do what I had been told. I said nothing. Levitsky said that if I were to tell anyone what was going on, I would be "squashed like a cockroach," and that they controlled the courts, the prosecutors, TV, newspapers, so that even if I did try and tell someone, no one would ever hear about it. One has only to remember the company considered by experts to be the most likely candidate for trading Khoper nickel – Glencore. How is that Pyotr Yamov knew general Kolesnikov? One has only to remember the company considered by experts to be the most likely candidate for trading Khoper nickel – Glencore. The wife of Denis Sugrobov (ex-head of the Anti-Corruption Directorate), Yana Tikhonova, is the head of Glencore's Russian office; and UGMK has been working with the Swiss trader for a long time on an agreement for selling copper smelted at the plant. UGMK is owned by Iskander Makhmudov, a businessman who has appeared on the radar of Western police and regulatory authorities a number of times The first time was in 2008, when the relationship between the former Uzbekistan-born, Israeli mafia boss, Michael Cherney and the Russian businessman Oleg Deripaska was revealed in London's Supreme Court. During the trial it emerged that Iskander Makhmudov had been Cherney's junior partner since 1992. The second piece of information about Makhmudov was also linked to his partnership with Michael Cherney and Oleg Deripaska, but this time in Spain. The company Vera Metalúrgica, which also belonged to Makhmudov, was caught laundering money; and in 2011 the Russian prosecutor general took over the case. Since then, there has been no information at all. Interestingly, the case is being run by the same Interior Ministry Investigation Department looking into the Khoper case.